A: 1. Ensure cd is placed well and not scratched. A: Blank cd is unformatted, please download the burning software. Advanced USB3.0 Technology: With Advanced USB3.0 Technology, the External CD DVD drive provide more stable performance and higher speed data transfer up to maximum of 5Gbps. Backwards compatible with USB2.0 and USB1.0. Great Compatibility: This external CD ROM works with Windows 98 / SE / ME / 2000 / XP / Vista / Windows 10/8/7, Linux,all Version MAC OS. Specially designed for Apple Samsung ASUS HP Dell Sony Acer and other Macbook, Ultra-book, Notebook or Laptop PC without drive hardware. 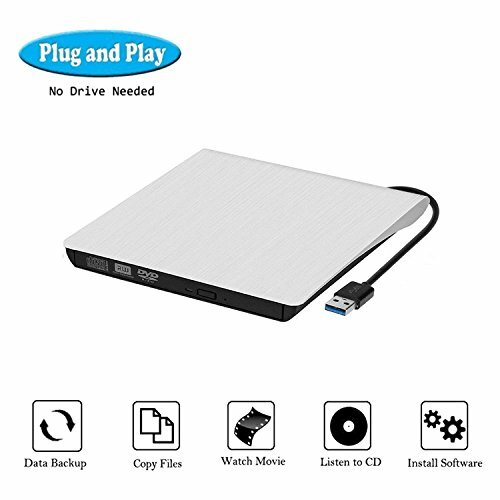 Easy to Use: Support Pulg and Play, our Portable DVD writer don't need to install the driver program, just plug it into your USB port and the DVD driver will be detected. When you connect it to the desktops, please connect it with the computer's motherboard to avoid of power shortage. Fashion Design: It comes with an eject button so that you never have to worry about your disc getting stuck inside this external CD/DVD drive. Embedded cable design, made with premium wire drawing material, enough fashionable and scratch-proof exterior. After-sale warranty: We offer you 100% risk-free satisfaction guarantee, and source the highest quality material with the most durable structural support. If you have any questions about this product by YSD, contact us by completing and submitting the form below. If you are looking for a specif part number, please include it with your message.